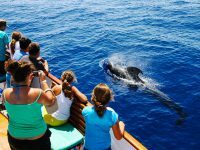 The sea area around La Gomera is one of the best areas in Europe for successful whale and dolphin watching tours with many great sightings. Welcome to our new website in the apartment complex of Paraiso de Conde in the Valle Gran Rey. After the relaunch our website with a new design shines.